Right around the corner from the hotel, we were staying at was a late night diner called Blondi’s Oasis. My wife Marcela was in a breakfast kind mood while I was in a…you guessed it! A Burger kinda mood. My Patty Melt came along with a couple of the usual diner suspects, Cole Slaw and a Pickle Spear…..also known as things I ignore aka filler. Marcela’s Breakfast Skillet brought a couple of Eggs on Ham, Onions, Potatoes & Cheese, she opted for Whole Wheat Toast with Butter. She dug in and really enjoyed it. My Patty Melt was right on. There were no earth-shattering changes made to it, it was exactly as I’d expect from a late night diner, no disappointment here. The Fries came a little bit after the ‘Melt and could have used a tad bit more frying. 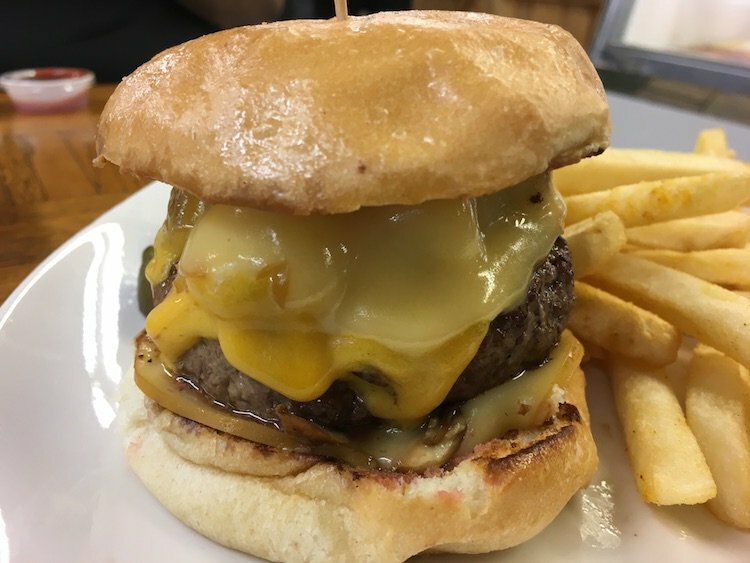 If you’re in need of a diner fix and in the area, hit up Blondi’s to fill that empty spot in your stomach.